This shop has been compensated by Collective Bias, Inc. and its advertiser. All opinions are mine alone. #HoneyForHolidays#CollectiveBias Making handmade gifts is incredibly easy and only takes a few minutes. 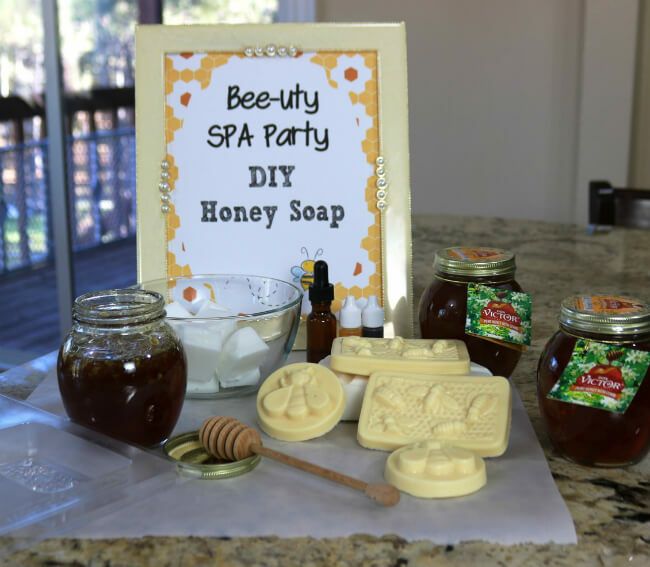 Here I’m sharing two simple DIY recipes for homemade honey-based gifts – my DIY Honey Soap Recipe and DIY Honey Lip Balm Recipe; and free printables to help you re-create this Bee-uty SPA party at home. Gift-giving is such a pleasure with these homemade honey-inspired gifts. Honey is well known for is fragrant and sweet properties, but did you know it’s also wonderful for skin care? Honey does amazing things for skin – healing chapped skin, providing moisture, and acting as a sealant against foreign invaders. 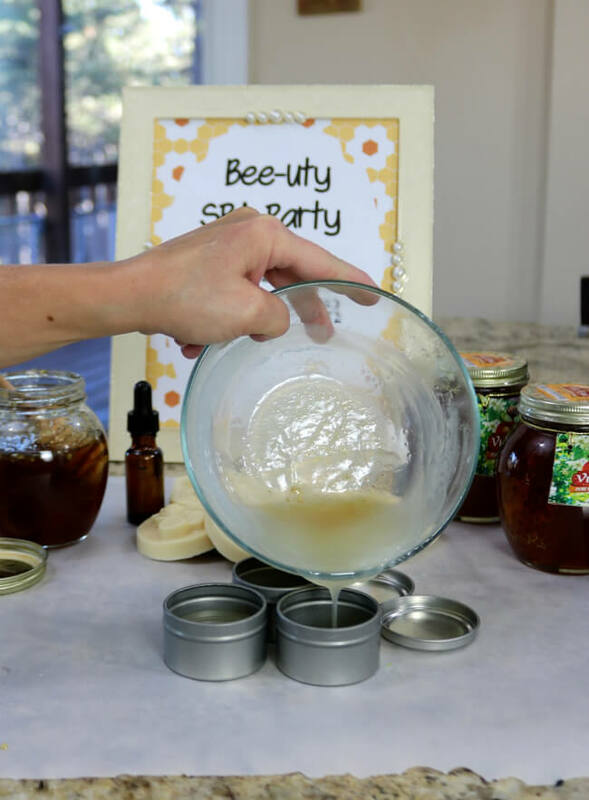 Protect and nourish your skin with these gorgeous and functional DIY homemade honey beauty care products. With changes in the weather already here, skin can look lackluster and dry. 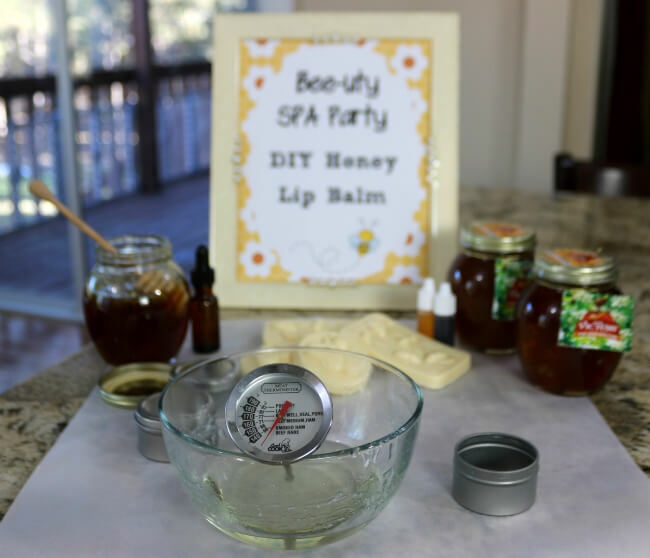 Make these honey inspired soaps and lip balms at home to keep your skin moist and soft. Perfect for gifts to give to teachers, friends, grandparents, and neighbors. Everyone can enjoy the healing properties of honey with these exclusive handmade gifts. These homemade DIY Honey Soaps and DIY Honey Lip Balms only take a few minutes to make and are very cost effective to give as gifts. Perfect for birthdays, special events or for Christmas – you can pamper friends and family with these sweet-scented beauty treats. I created these easy recipes in the microwave. Heating takes only a few minutes. In addition, I’ve created some printables to help readers create a “Bee-uty SPA Party” at home. The download includes free labels and singe. 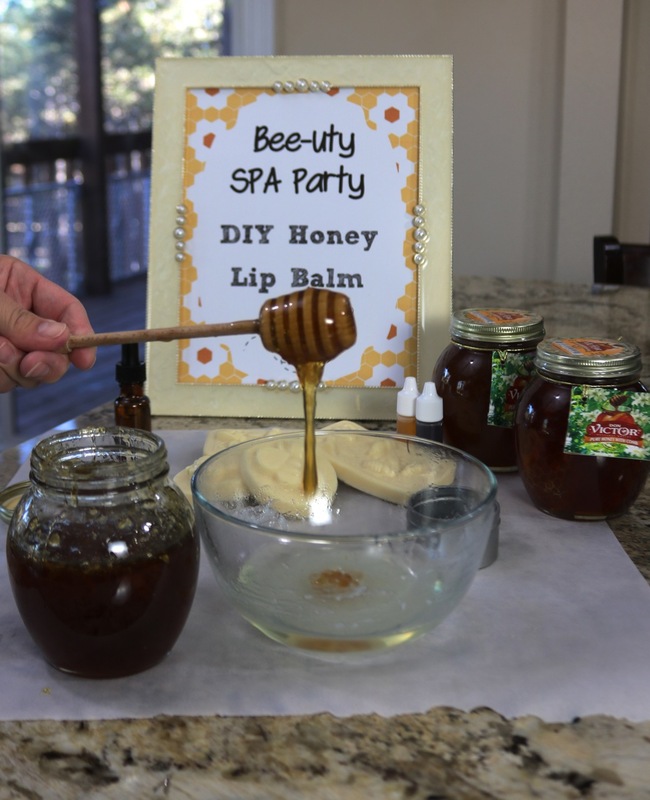 Gather up a few friends and enjoy some tea with honey and create these DIY homemade honey beauty products at home. Step 1: Gather your ingredients. Having everything gathered together and ready to mix makes creating these soaps much easier. Step 2: Cup the soap. I used a kitchen hammer and knife to cut the soap into smaller squares for quicker heating. I used 10-12 squares of soap for each batch. Each batch will yield 3 to 4 soaps from the soap mold. I only used 2/3 rds of the mold depth for each soap. The soap base is also available in a goat’s milk, shea butter, and olive oil combinations. Step 3: Melt the soap base. Heat the soap base for 30 seconds on high in a glass or microwave safe bowl. Once partially melted, you can cut the soap into smaller pieces with a knife for faster heating. Keep heating the soap base on high in 10 seconds intervals until completely melted. I heated mine for a total of one and a half minutes. Step 4: Add the colorant. I used seven drops of yellow and one drop of red to create a golden hue for the soaps I’ve featured in this post. Be careful. Too much red will give you an orange color. Step 5: Add the scent. 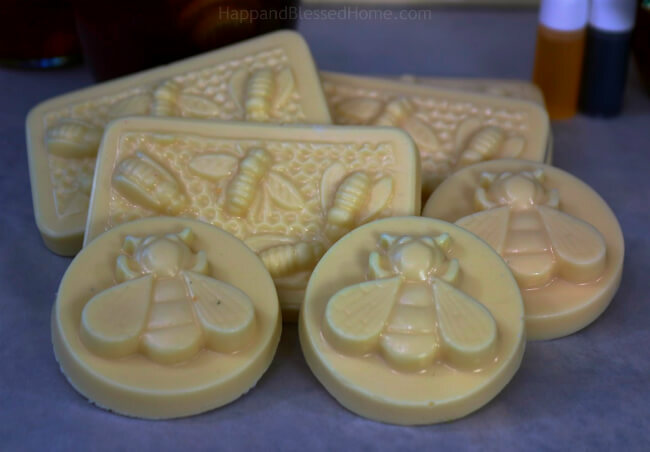 I used a honey almond fragrance for these soaps to stay within the honey theme. The smell is delightful – soothing to the senses. you only need one to two drops as the scent is concentrated. Stir everything until evenly combined. If you enjoy essential oils you may want to use essential oils instead. 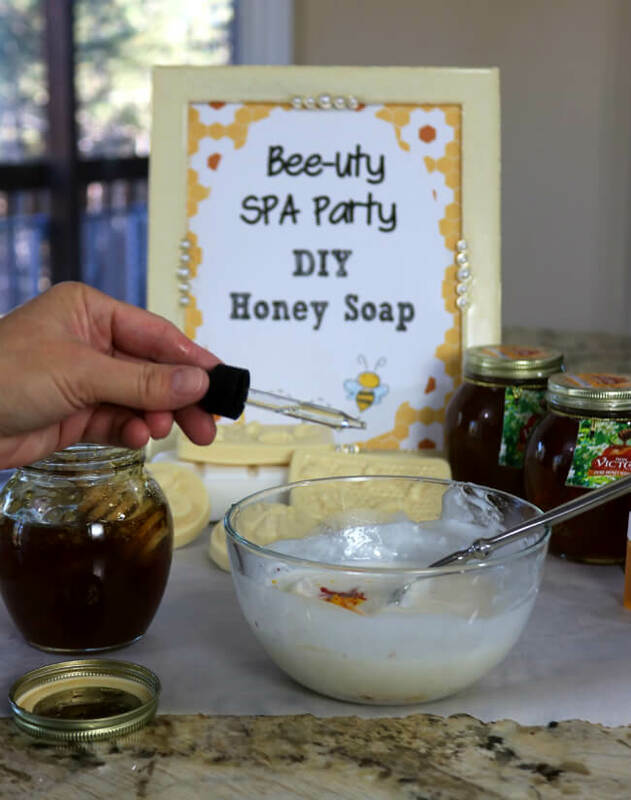 You need to only add one to three drops of any fragrance or oil for this honey soap recipe. Step 6: Reheat if needed. You may notice a skin developing on the liquid soap surface. If that happens, re-heat the soap for 15-20 seconds in the microwave on high. Step 7: Add the honey. Double check the mix before you add the honey with thermometer. You want the mix to be at about 100 degrees. If honey goes above 100 degree it loses some of its properties. Add the honey when the mix is right around 100 degrees fahrenheit. Don Victor Honey is raw, filtered honey, not heated or processed in any other way. Don Victor Honey includes honeycomb in the jar. Use a knife to cut the honeycomb into smaller pieces. 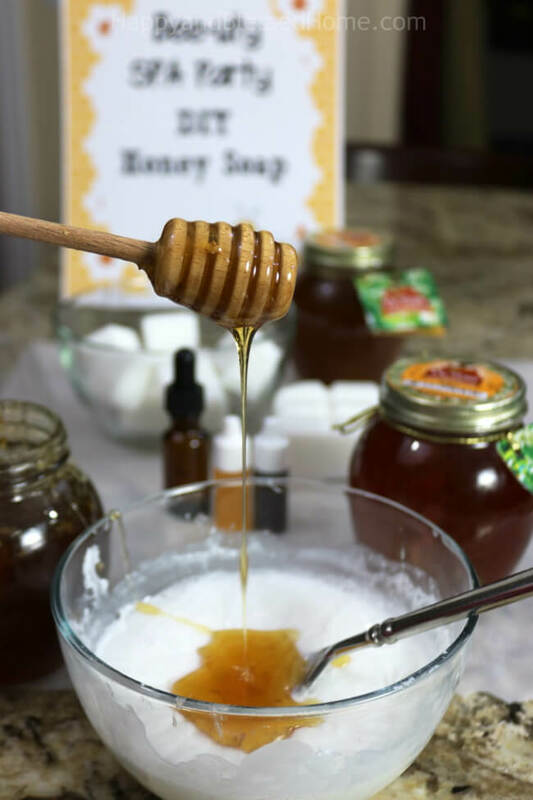 Honeycomb is a wonderful natural skin exfoliant. 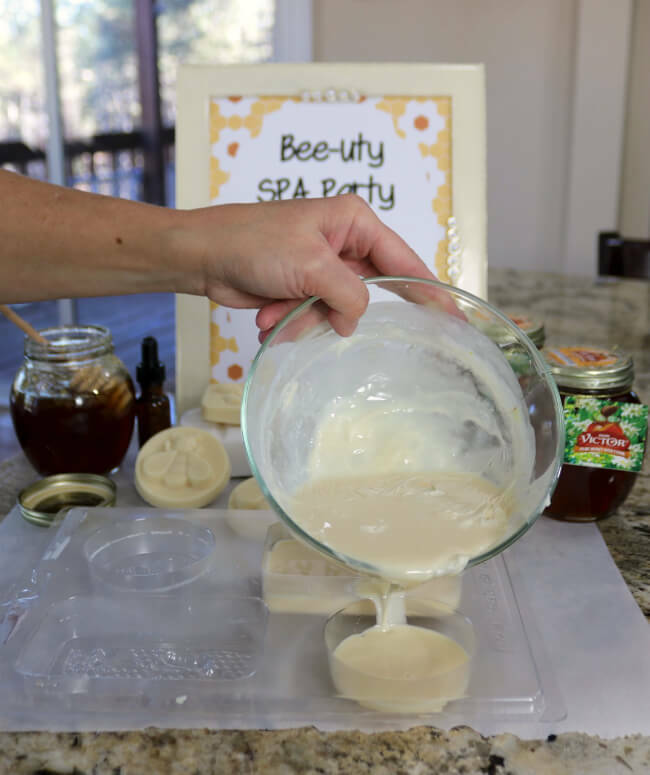 When you add the honey to the soap mixture make sure to add some of the honeycomb for extra texture. Stir to ensure an even distribution of honey throughout the mix. Step 8: Pour the soap into the soap molds. As you pour, you may notice a skin forming on the surface of the soap liquid. When you’re near the end of filling your soap molds, just microwave the drying soap for 10-20 seconds so you can add it to the molds. You’ll need to work quickly. The soap will start to form almost as soon as you pour it into the molds. Step 9: Remove the soaps. You should be able to easily remove the soaps from the soap molds in about 2 hours. Gently apply pressure to the printed (or underside) of the soap mold to dislodge the soaps. They will not have completely set yet, but they should be solid enough to remove. You can also refrigerate them to speed up the solidification process (or if you live in a warm climate). 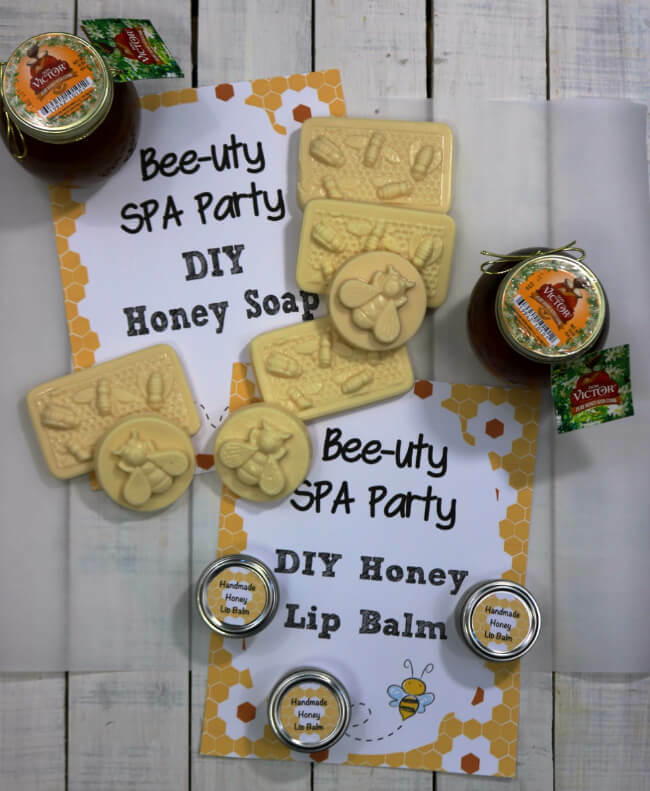 Click the blue “download now” button to download your free copies of the printable labels and signage to host this DIY “Bee-uty” SPA party at home. Step 1: Gather your ingredients. Having everything gathered together and ready to mix makes creating these lip balms much easier. Step 2: Cut the beeswax. You can shave the beeswax with a grater or cut it with a knife into small chunks. Weigh it with a kitchen scale in a glass bowl. Make sure to zero out the scale with the glass bowl on top before you add the ingredients to get an accurate weight. Step 3: Measure the oil. Measure and add 5 ounces of jojoba oil (or the oil of your choice) and add it the solid beeswax. Step 4: Melt the beeswax and oil. Heat the mix for 30 seconds and then in 10 second intervals until completely melted. Mix until throughly combined. Step 5: Take the temperature. Honey loses some of it’s amazing properties when it’s heated to over 100 degrees fahrenheit. Using a thermometer, keep an eye on the temperature of the mix until it’s right at 100 degrees. Step 6: Add the honey. Add the honey when the mix is right around 100 degrees fahrenheit. I used a honey wand to add honey, but you could easily use a spoon. Step 7: Reheat if needed. Again, be careful not to overheat. If the mix becomes non-pourable, just reheat it in 10 second intervals until it becomes pourable again. Mix the ingredients to combine again if needed. Step 8: Pour the mix into the containers. You should be able to pour the foggy mix into the containers. Allow the mix to cool. Once cooled you can test the lip balm with your fingers. If the balm is too hard you may have too much beeswax. If it’s too soft or mushy it may have too much oil. If needed, you can melt everything and try again by adding either more oil or beeswax to achieve the desired constancy. I use a candle warmer (it’s like a mini heating tray) to melt lip balm and remix if needed. Now your lip balm is in the container. Let it cool and add the lid. I’ve included some fun and cute lid covers with this post. They will fit a lid that is at least 2 inches in diameter or larger. Just print them onto 8 1/2 x 11 inch shipping labels (in white) to create lid covers for this wonderful homemade gift. 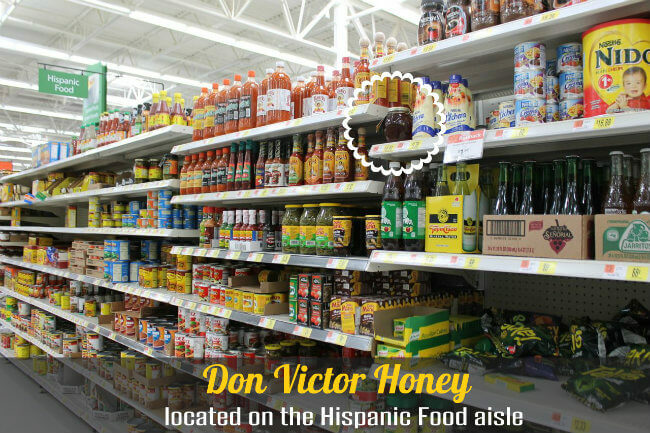 Don Victor honey is located in the Hispanic Food aisle at Walmart, and can not be found alongside honey elsewhere in the store. Our family loves the honeycomb that is included in every jar of Don Victor honey. Do you enjoy honey? Follow Don Victor Honey online for special offers, recipes, and giveaways. Have a favorite Honey Craft to Share? 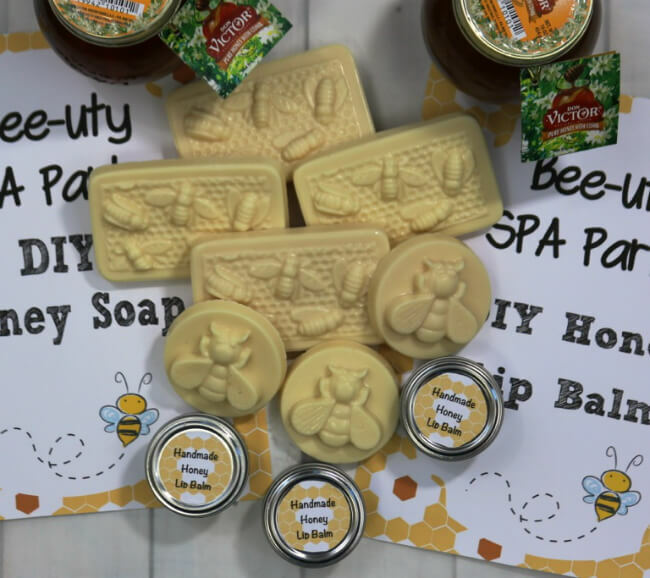 Do you know someone who would enjoy honey soap or honey lip balm? 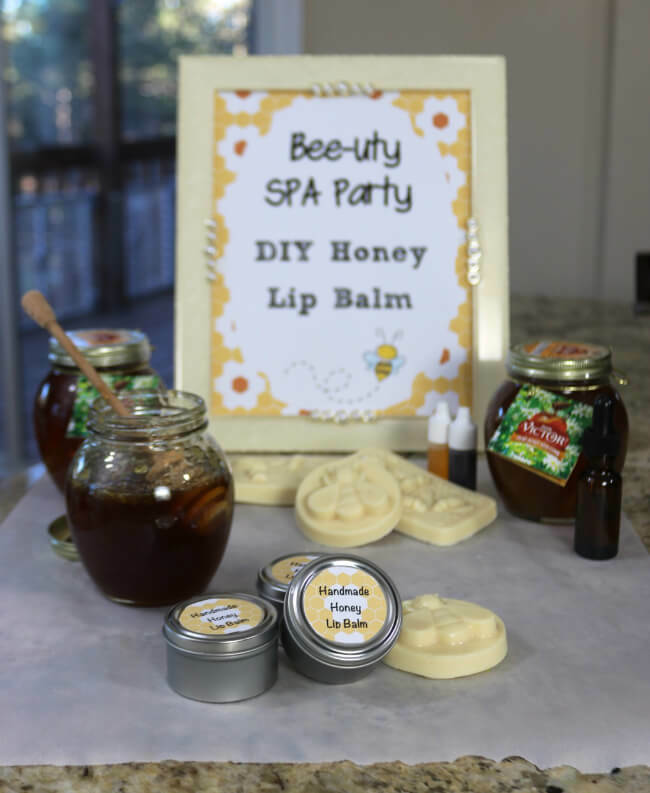 Have any fun honey craft ideas to share? I’m always looking for new ideas. Please leave a comment below and join the conversation. I love hearing from my readers! Thanks for being a fan! Do you have a board for DIY recipes or gift ideas on Pinterest? Help spread the word and PIN this post on Pinterest! Thanks Rocio! 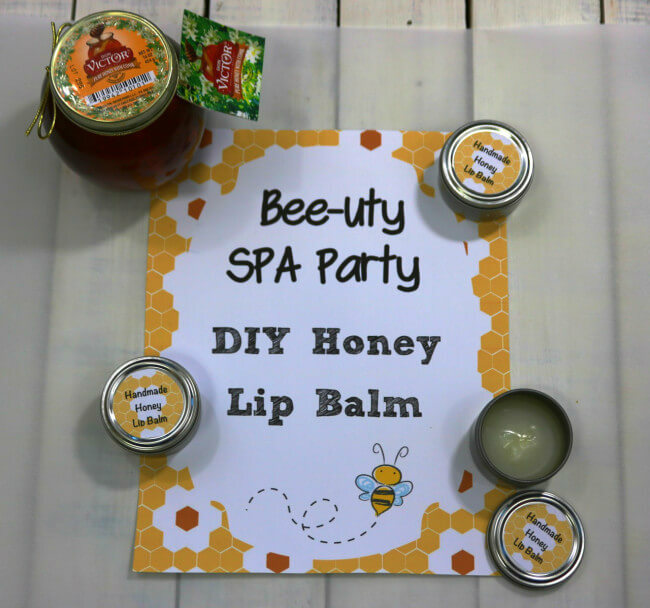 I love your lip treatment with honey too. Thanks for the encouraging comment. Those are adorable!! I will definitely have to try them. They would make perfect gifts. 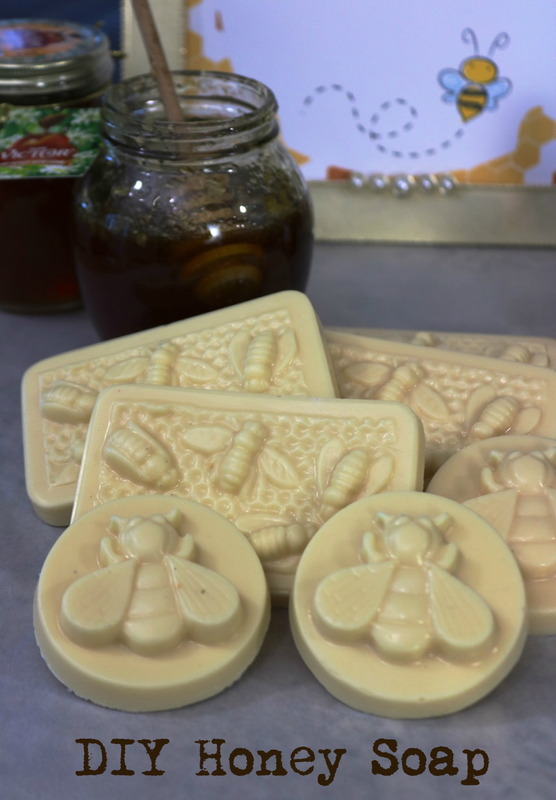 The little bee molds are too cute!